As I grade book reviews on the subject of the historical Jesus, method is on my mind. Well, method is always on my mind, but particularly so this afternoon. I see in the papers my students have written references to scholarly review after scholarly review of the books they have read, reviews in which book after book is damned if it did and damned if it didn't. If the author has a method, s/he is criticized for creating it in such a way that the Jesus s/he wants to emerge really emerges from the texts. If the author doesn't have a method, s/he is criticized for not having a method, which allows for the Jesus s/he wants to emerge really emerging from the texts. It is a quandrey, to have a method or not. Since the criticism from scholarly opponents is the same, it's far easier not to have a method. So should we give it up? I don't think so. Ease is not at issue. Nor do I think that the criticism lodged against those who implement method is necessarily fair. What is at issue is that the scholar's thinking be visible, consistent as possible, reasonable given the evidence, verifiable by other scholars, and controlled so that the amount of subjectivity that creeps in is minimalized. For me this means that a well-thought out method must be put into place, and perhaps the Jesus that emerges doesn't so much look like the author as he looks like the author's interpretation of the evidence. In other words, I wonder if I were to take the same evidence, put it through Crossan's method, and write it up in a book, would my Jesus be the same as Crossan's? There would be strong resemblances, I'm sure, but there would be differences too. My categories and language would be different. Jesus would emerge in the language of my own interpretation. This musing has set me to thinking about my own application of method to the Gospel of Thomas in Recovering the Original Gospel of Thomas. Now that my book has been "out there" for a couple of years, I see this same stock criticism emerging among my own detractors. Does my method lead us where I want us to go? My response is this. I put my method into place to maintain academic integrity and minimalize subjectivity. However, this does not mean that my method is without interpretation. It is not just a bunch of data gained through a questionnaire survey or poll. It is a careful method developed to explain the compositional history of the Gospel of Thomas, which I understand to be that of a rolling corpus (which I argue makes the most sense given what we know about the oral-rhetorical culture of the ancient people). 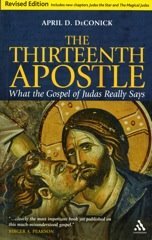 Given the theoretical model that the Gospel of Thomas began as a smaller collection of sayings that expanded over time, how might we go about separating the earlier sayings from the later? Using a conservative and cautious approach, I began by identifying only those units in the Gospel of Thomas that I was 100% convinced represented secondary development. These units were sayings that had been given contexts (dialogues, question-and-answer units) and interpretative clauses (tacked onto an older saying usually at the end). These questions and interpretative clauses are clearly secondary to the saying, not only in terms of retrospective content, but also because versions of the same sayings circulated in other imaginary contexts without the interpretative clauses in early Christian literature. It is also helpful that these secondary units appealed to issues of late first and early second century Christianity, and appeared to be adapting an earlier saying to a later hermeneutic. So I conservatively worked backwards. When I examined these secondary units as a whole, and I made a strictly literary-critical analysis of them, I noted consistency across them in terms of characteristic vocabulary and themes. How did I identify these items? The items I identified had to be characteristic of the Gospel of Thomas, not simply plain language similarities or terminology common to many other early Christian sources of Jesus' sayings (like the words "God," or "inside," or "blessed are," etc.). More importantly, the mere presence of a word or phrase or theme was not enough. To identify characteristic terminology or themes on this basis would be nothing more than parallelmania. So their identification was bound up for me with explicit references to the pattern of their usage. For instance, the word "living" was identified as characteristic in the sense that it is used as a Name of God and as a cognate designation for the believer. Someone has asked me why didn't I identify "rest" as one of those characteristics since it emerges in the secondary sayings 50.3, 51.1, and 60.6? All of them appear to refer to some kind of final state of rest for the soul, although 50.3 is coupled with "movement" while the other two are not. In the case of 51.1, it appeared to me that the Greek anapausis probably was a scribal shift, originally reading anastasis "resurrection of the dead" rather than "rest of the dead." So I was concerned that the usage of the word "rest" was not consistent. In addition, the only saying in the Kernel that also has anapausis is 90.2, and this saying clearly uses the word to refer to relaxation from labor, not a final eschatological state. By the way, 61.1 and 86.2 also translate "rest" but this is not from anapausis, but the Coptic emton which in both of these cases refers to sleep. At any rate, this post is getting far too long. My point is this. Method is necessary to maintain academic integrity. But this does not mean that method is not an interpretative process, and it is this interpretative nature of method that provides us with a variety of understandings of our texts. If there is interest, I will post more on this subject in the future. Personally, I would deeply appreciate it if you could post a list of your favorite 3-4 books on methodology in religious studies and/or biblical studies. It might prove interesting to have your readers answer with their favorites. Ultimately, the point of methodology is to attempt to reduce error, especially the kinds of error that derive from our egos projecting our own prejudices onto our subjects. The unfortunate fact that the methods themselves cannot prevent all of our stuff from leaking out does not imply that we should avoid using methodologies or careful, rigorous thinking. But a quality control process that is 80% or 90% effective is better than a process that is 10% effective. The Apostolic Tradition as "living literature"
What is the Kernel Thomas?